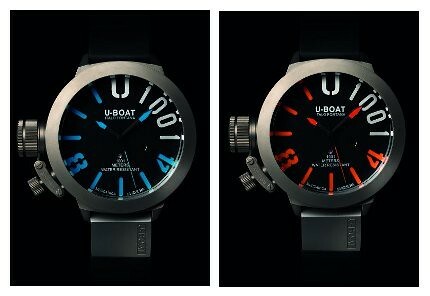 At the last Baselworld exposition in Switzerland, U-Boat released several new models. Now that two of these models are on the verge of being delivered, it is a good time for me to introduce them to you. The first is an old Classico revisited. A chronograph model has been added to the Classico series. The watch, which will be available in the standard U-Boat sizes of 45 and 53mm, is similar in style to the old Left Hook Cronos that the company manufactured during their first few years of production. The quality of the new chronographs far surpass that of their ancestors. The watch runs on the infamous ETA (Valjoux) 7750 chronograph movement and sports a sapphire crystal and sturdy stainless steel case. The dial revives the linear-style subsidiary seconds of the Left-Hook, and stays true to the simplistic design of the Classico series while offering 30-minute and a twelve-hour counters for the chronograph. With the Classico 1001, Italo Fontana evolves the Classico series visually and technically. The 1001 gets its name from the fact that it is rated to withstand pressures of 100ATM. That is the pressure found at 1000 meters below the surface of the water. To achieve this, the sapphire crystal has to be extra thick, the watch has to be equipped with a pressure release valve - seen on the side of the case at 8 o'clock - and the crown and case back have to be extremely well engineered and assembled. 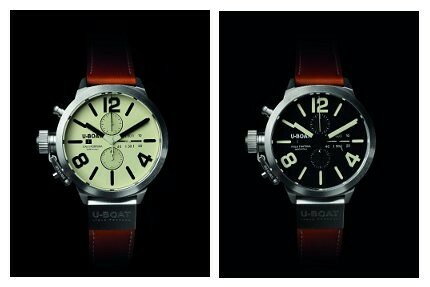 The 1001 will only be available in a 55mm case, which is probably why U-Boat chose to construct the watch using titanium. Despite its large size, the watch is not very heavy and sits comfortably on the wrist. Both these models will be available in the coming months. A limited quantity of the 1001 models can be pre-ordered at Matt Baily.